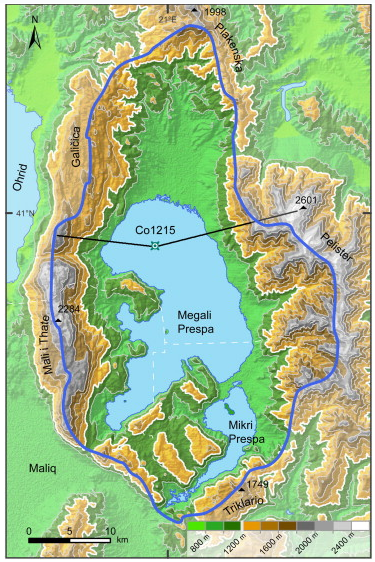 In the Ottoman period (lasting here from the 14th century to the 20th), the area around the Prespa Lakes was united under the administration of a single province. 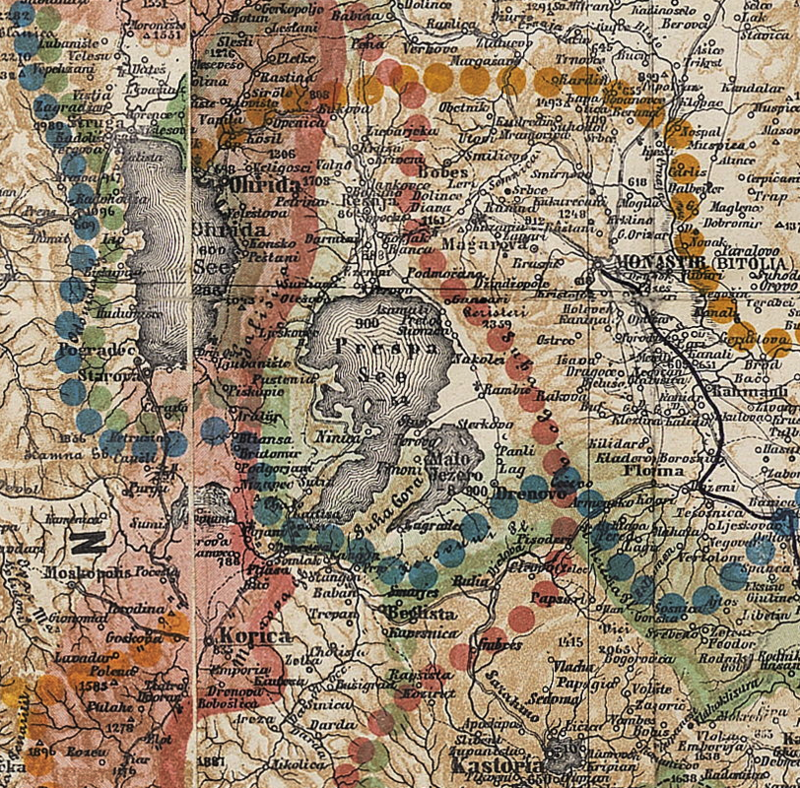 As seen in the mid 19th century commercial map on the top left, a series of roads connected all the cities around the lake (not pictured) and it took about 20 hours to get from Bitola/Monastir to Korca. The second map, on the top right, shows that, like most areas in the Balkans, and indeed around the world, the ethnic composition of this territory was diverse. 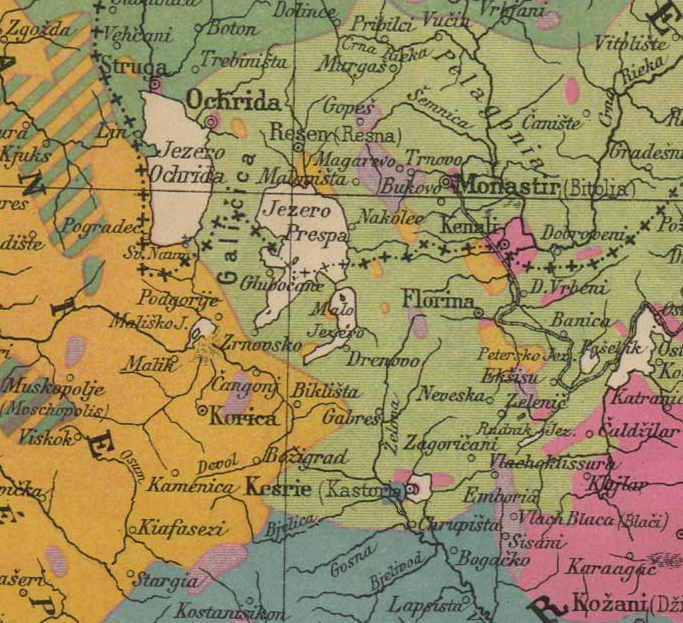 This map, which describes itself with unusual candor as being from the Serb point of view, shows a mix of Serbs in dark green, Slavic Macedonians in light green, Albanians in orange, Greeks in blue, Turks in pink and Vlachs in purple. The region around the lakes was then divided following the Balkan wars between 1911 and 1913. This division was done by military force, with little regard to the identity or wishes of the inhabitants. 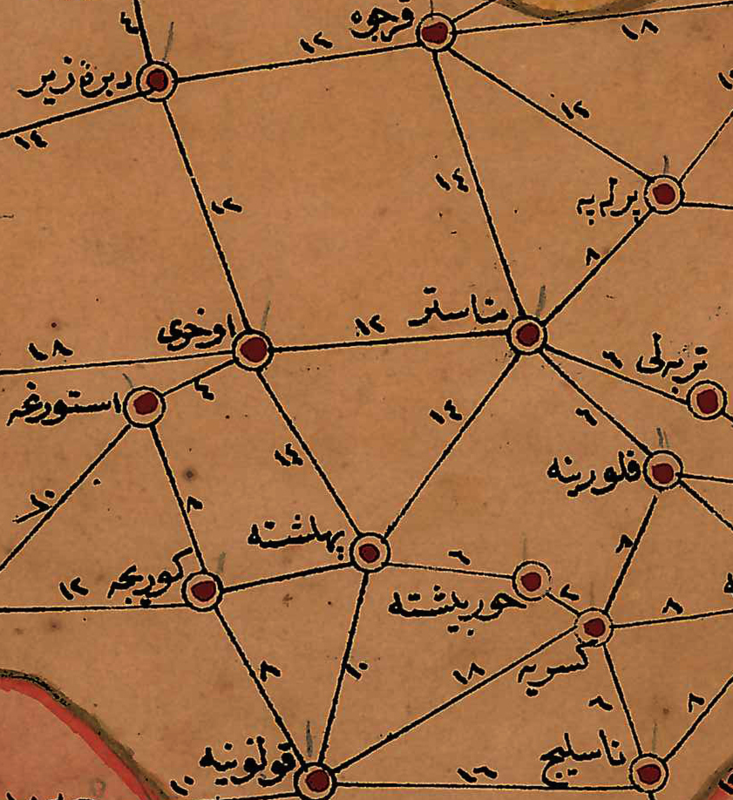 Yet this ethnic map offers perhaps the best evidence of why a more "accurate" division would have been impossible - patterns of human habitation are simply too complicated. What is more, nationalist ambitions were too grandiose, as shown by the interlocking Greek (orange), Albanian (pink) and Serbian (blue) claims to lake in the map below. As the map in the bottom left shows, Yugoslavia (now Macedonia) took the part to the North, Greece the part to the Southeast and Albania the part to the Southwest. For most of the 20th century these borders separated the residents along the lakes' edge, especially after the Greek Civil War made the region a Cold War faultline. Indeed, visitors to the region can still see the remains of military posts and guardhouses dotting the landscape, as well as deserted and destroyed villages emptied of their Slavic-speaking inhabitants during the civil war. Subsequently, the Greek government engaged in a conscious attempt to Hellenize the region, encouraging immigrants from other parts of the country (in many cases families who were still struggling to recover after their forced emigration from Turkey) to move to the region. More recently, the area has begun a limited reintegration under the aegis of the EU, as a transborder park. All three countries have designated their section of the lakes a park and engaged in some joint conservation efforts, promoting a newfound focus on the lakes as a coherent region, united by geology and ecology rather than divided by borders. That said, border crossings in the park remain closed, so visitors who want to see all three sides of the lake need to exit the park and travel on the larger roads between Florina, Bitola and Korce. 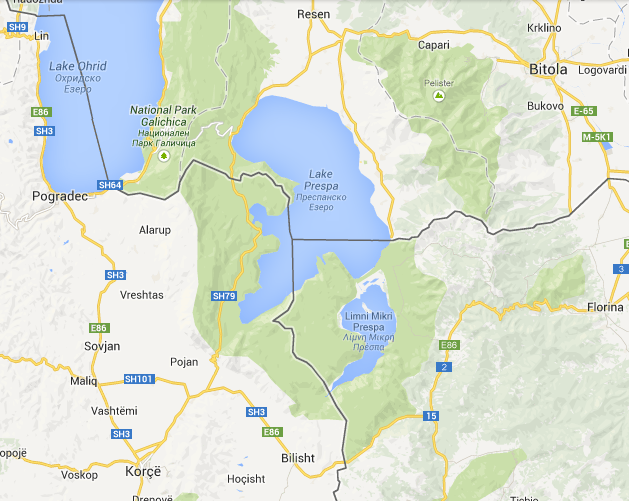 Once in Macedonia, its easy to visit Lake Ohrid, which is connected to Prespa by an underground channel in the porous limestone (find out more on LakeNet!) and home to the flagship of the Macedonian navy.